My wife and I have just returned from a road trip to Sydney to visit family. Grandchildren can be so persuasive; “We insist you come to stay with us,” said Mr Nearly Five Years Old. While we have flown over to Sydney on several occasions – it’s nearly 1400km each way – we prefer to drive because we enjoy the passing scenery, flora and fauna and the birds, of course. Yes, it’s tiring travelling non-stop for two full days, but we take it in turns to drive. When I’m at the wheel my wife records the birds I see and can identify along the road. Identification can be challenging when hurtling along at 100kph on a busy highway. And when it’s my wife’s turn to drive I can give a little more attention to what is flying around, or sitting on the roadside – or even on the road itself. I usually try to arrange to be the passenger when we are crossing the Hay Plains between the towns of Balranald and Hay in far western New South Wales. This long stretch of road has huge expanses of grassland and saltbush with only the occasional tree until the last 20km just east of Balranald. Usually the birding along the 130km road is excellent with plenty of birds of prey. On this trip however, I saw few birds other than Emus. Just got back from a trip to Bathurst (from Adelaide), I’ve never seen so many Emus! Absolutely amazing to me, thought there must have been an Emu farm or something going on around Hay. Thanks for the comment Sam. I will keep a look out for them when we travel over to Sydney again in early December (the grand children keep on asking when are we coming again). 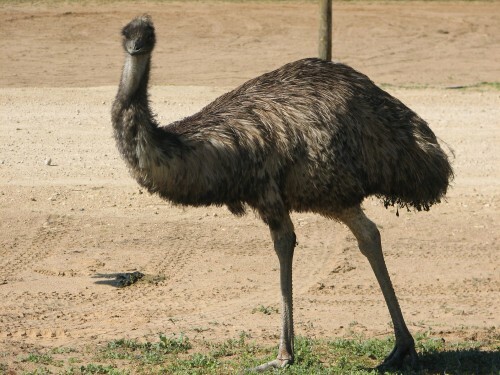 I wonder about this influx of large numbers of Emus. It might be as a result of good rainfall in the Hay area over the last year, providing good conditions for breeding. Many of the birds we saw were half grown. The other possible reason is the continuing drought conditions in Queensland, forcing large numbers south. This happens from time to time. Emus are known to be partially migratory in response to good or bad conditions, except in WA where huge numbers (100s of thousands) migrate annually. Or it could be a combination of the two.